How Can Discontinuous Electrification Be Handled? On the proposed South Wales Metro, it is proposed to use discontinuous electrification to avoid rebuilding a lot of bridges and other structures. The document states this about the electrification. Discontinuous overhead line electrification to 25 KVAC with permanently earthed sections around restricted structures, saving 55 interventions e.g. rebuilding bridges/no need for wire in Caerphilly tunnel. So how are these interventions avoided? On the Karlsruhe Stadbahn, similar Citylink vehicles to those proposed for Cardiff need to work on both the main line 15 KVAC used in Germany and the 750 VDC used by Karlsruhe trams. To isolate the two voltages, a ceramic rod is placed in the catenary. The vehicle’s pantograph just rides across the voltage boundary and the vehicle’s electrical system uses whatever voltage is present. These pictures show some of the types of bridges on the Cardiff Valleys Lines. They are a real assortment. Some station footbridges from the Victorian era with nice castings and decoration, but no much-needed step-free access. Some quality brick and stone arch bridges. Some modern road bridges in steel and concrete. I also saw sizeable pipelines over the railway, which would need to be raised. The greatest number were simple steel bridges like the one at Caerphilly station, designed to get pedestrians and cyclists, who were not using the railway, from one side of the tracks to the other. I suspect the simplest way would be to erect two standard gantries at a safe distance of a few metres either side of the structure. 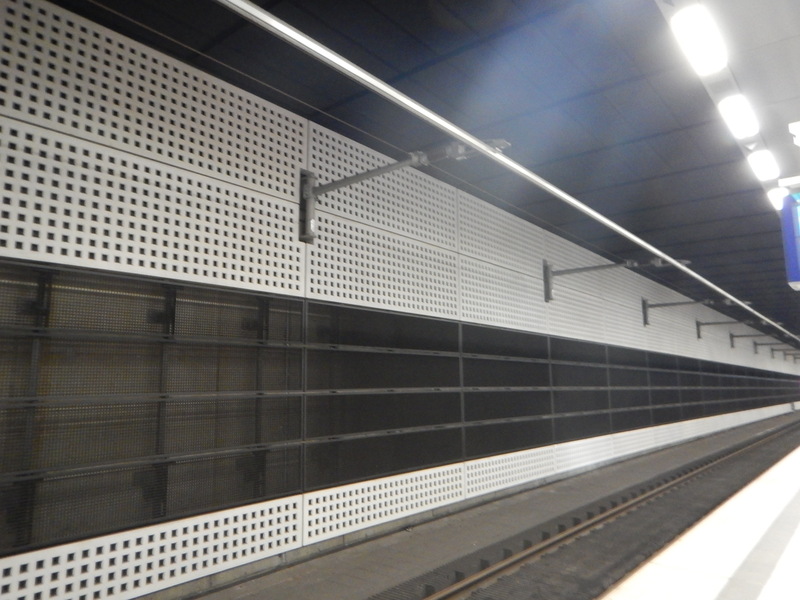 Between the two gantries would be an conductor, like this one. that I photographed in the Berlin Hauphtbahnhof. It would be earthed, so that it offered no danger to life. There could even be extra supports under the bridge. At each end, it would be connected to the 25 KVAC using a ceramic rod or other insulating device. The vehicle’s pantograph would then ride from one side of the bridge to the other on its own track without being lowered. Anything electrified at 25 KVAC would be kept at a very safe distance from the bridge. In the earthed section, when the vehicle would be receiving no power, the vehicle would automatically switch to battery power. There would be no driver action required, except to monitor it was all working as it should. As on the South Wales Metro, it appears that all vehicles using the lines proposed to be electrified will have their own onboard batteries, there shouldn’t be any problem. In some ways, this discontinuous operation is a bit like using your laptop connected to the mains. When say the cleaner pulls out the plug to put in the vacuum cleaner, your laptop switches automatically to the battery. The Caerphilly tunnel is over a mile long. 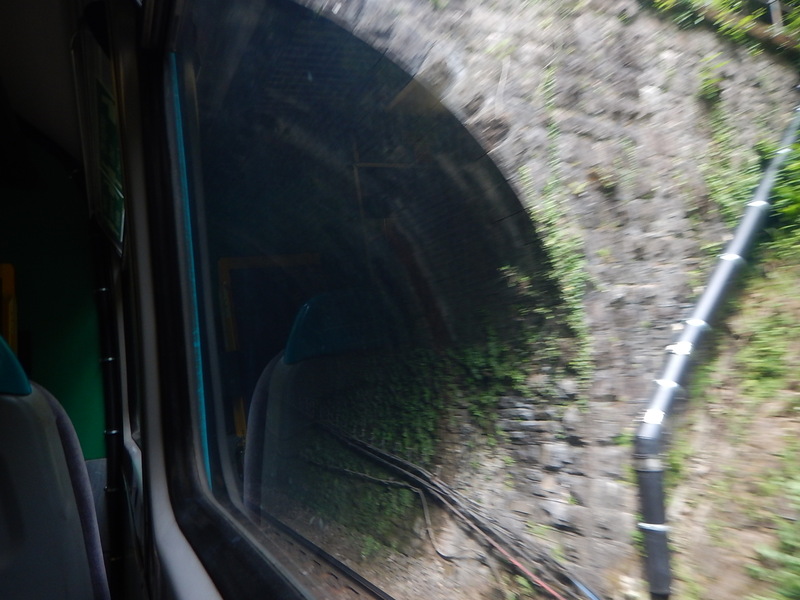 This picture shows the tunnel entrance. It would probably be possible to electrify using a rail in the roof, but why bother if the trains running through the tunnel could go from one end to the other on their own battery power? Trains could lower the pantograph before entry and then raise it again, when under the electrification at the other end. This could be performed automatically using a GPS-based system. I have also had an e-mail, which said this. As I understand Caerphilly will have a natural bar in it but be much closer to the train roof than would be allowed with a live one. A composite or earthed metal rail would be fixed to the roof of the tunnel, so that the pantograph could run smoothly from one electrified section on one side of the tunnel to the electrification on the other side, using battery power all the way. In Novel Solution Cuts Cardiff Bridge Wiring Cost, I talked about another method applied in South Wales to avoid rebuilding a bridge. At this bridge, traditional electrification methods were used, but the need to demolish the bridge was avoided by using advanced insulation and protection measures. This was my final statement. Network Rail reckon that the solution will save about £10 million on this bridge alone, as it avoids the need for an expensive rebuild of the bridge. The savings on this bridge will be higher as it is a large bridge over several tracks, but even saving a million on each bridge in the South Wales Metro is £55 million, which will probably be enough to build much of the infrastructure to extend to The Flourish, which would appear to not need expensive viaducts or electrification. Should Downhill Tracks Be Left Without Electrification? I think this may be possible on the South Wales Metro, as vehicles coming down the hills could use gravity and small amounts of battery power. Regenerative braking would also be continuously charging the batteries. It would certainly be simpler, than having to constantly swap between overhead and battery power on the descent, where the electrification was discontinuous. As the lines are going to have a more intensive service, there will be additions of a second track in places to allow trains to pass. Any electrification that could be removed from the project would be beneficial in terms of building and operational costs. This post has used the South Wales Metro as an example, but I don’t see any reason, why the discontinous method and that used on the Cardiff Bridge can’t be applied to other bridges and structures over the lines on other routes in the country. I suspect, that if they’d been used on the Gospel Oak to Barking Line, electric trains would have been running months ago! Look what you get with thinking, when you have a Bonfire of the Boxes!